When Dibble's weekday program comes on XM Radio's channel 175 at 3 pm, I shut the radio off. He is pompous and insufferable. When watching Nats games on TV this season, I suggest turning down the sound and turning on the radio. Carpenter is tough enough to take, but, combined with Dibble, you have a disaster. Dibble needs to be educated. The Washingon Nationals are not a new franchise; they transferred here from Montreal. The franchise began operations as an NL expansion team in 1969. You're not insinuating that Dibble being an Red had anything to do with him getting the job, are you? Sheesh! That's like saying that Tony Blanco, Wily Mo Pena, Austin Kearns, Aaron Boone, Bob Boone, Felipe Lopez, Charlie Manning, and many others were welcomed into the Nationals Family merely because they were former Reds rather than the superstars they are. Dibble is a dope that talks in circles. His tone is very peculiar for a big guy...it reminds me of a whining bully, if you can imagine the creep in ..."Back to the Future". I've listened to him for hours and have spoken to him several times on XM, and it is really weird. Every time he speaks and tries to make one of his nonsensical points, he always sounds like he is whining. He’ll be very different than Sutton, but I am not sure if it will be in a rewarding way. I think he and Bob Carpenter can click as Bob adapts well to just about anyone. When Paciorek was here and clowned around it made some of those horrific games tolerable, that is until the end of the season when Paciorek started making no sense at all. Charlie and Dave on the radio certainly is a good alternative. If only I could get the radio broadcast to sync with the TV broadcast I get via DirecTV. From the point of view of Washington, the Nationals ARE new. Most Nats fans in this area consider Walter Johnson, Clark Griffith, Bucky Harris, Mickey Vernon, and Frank Howard part of our true history, NOT Rusty Staub, Gary Carter, or Vladimir Guerrero. This makes me sad. Dibble is a poor choice for a well-educated Washington market that cheers for its teams with passion, but respects the opponent and understands that games are not as important as other things like financial meltdowns, international terrorism and rampant unemployment. Whoever made this decision has a "tin ear" for this market, but, then again, it's what I've come to expect from the "Bawlmer" guys who run MASN. Anything to denigrate the Nats and treat them like 2nd class citizens and make their tv ratings even lower. Chapter 11 can't come fast enough for the joke that is MASN! I'm just going to cut to the chase and buy Reds tickets. Might as well get the real thing, not 2001 Reds v2.3. I think that Don Sutton has done a smart thing in going back to his broadcast roots. The Nationals are lucky to have landed Rob Dibble. At least I kind of liked him when he co-hosted a talk show with Dan Patrick about five years ago. I'm willing to give him a chance. Frankly, Sutton was too good to be stuck out here in D.C. with this uninspiring team. I never really understood why he left Atlanta. Absolutely Brilliant. Another masterpiece by the Nationals. The ownership and management group of the Nationals are a bunch of clowns. Thanks for another joke. Edward Cunningham--Those franchises you mentioned moved to Minnesota and Texas. The current franchise has its orgin in Montreal, like it or not. The current DC franchise is 40 years old. Please try to remember that the Nats do not run MASN and shouldn't be entirely blamed for their hiring practices. Please fans, if you love baseball ..get into XM..and listen to Dibble from 3 to 7. You can determine if he is a dope. Even if you think he is a dope you'll like mlb on XM. Inexpensive method to hear all the games. you get all the home bradcasts of all the MLB games. ...now let's see: Bowden has 7 MLB outfielders and wants X. Nady. Look it up Bowden is the dopeyiest GM ...Dibble is a perfect fit. After the Nats draw 1.5 Mill in a 2 year old park.... it will persist why?..the Senators left twice!..look it up..Twins...Rangers. He has a sense of humor, which was sorely lacking for two years. I think he will click with Bob and make him a little more "tell it like it is." But it will take me a lot to not listen to Charlie and Dave. They are really good. BTW any other refugees of RCN out there? I just switched to Direct TV and am really impressed so far. I have just finished watching the Mets defeat the Nats for the second day in a row on MASN. I must say Dibbs is the whiniest commentator I have ever heard. He constantly repeats his complaints excessively. Last night, he would not shut up about the visitor's bullpen location at the new Citi Field. Today and last night, he kept commenting on how the Nats did not take pre-game infield warmups. Alright already Dibbs! It did show with all the errors the Nats made today though. When I watch MASN in the future, I will try to keep the volume turned down! 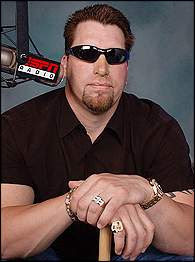 XM is going down for the count with non-talents like Dibble and "Daffy Duck" Jody Mc Donald.. I have always been in awe with how DC was awarded a franchise without a foundation of experienced success oriented management. Jim Bowden never did anything to justify his position, not to mention making him the initial hire...and lo and behold he may be in jail before Elijah Dukes! Hiring Dibble just reinforced the nonsensical direction the Nats have taken. He is certainly unlistenable for anyone with reason. The only reason I watched the Nationls (DAILY) was of his comments of telling it like it is.I will miss the Nats and him.